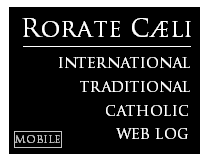 RORATE CÆLI: Fontgombault Sermon and Address for the Assumption: "They talk about peace, while war is brought to wombs by abortion!" Every true jubilee, even more so after sixty years of an especially fruitful religious life, should listen to this double blessing. The community of monks that you have served as their Abbot for more than thirty years, your family, and the Church, should bless you, and bless God for His faithful presence at your side: God, Who has given you the grace to persevere in the monastic life that you had chosen; God, Who has made use of your hands to give life to new fruits, both visible and unseen, known and unknown. May you yourself bless God! The Church rejoices today that Mary has been taken up body and soul into Heaven. The Assumption is like the final blessing in Mary’s earthly life, the divine seal that seals for an everlasting life Mary’s Fiat, a Yes to God that has never been belied. After she has exercised her motherhood over the Child Jesus and the newborn Church, Mary, with the power that she holds from her new condition, now exercises her motherhood over every man that comes into this world. In Bethlehem, God came to us in Jesus Christ through Mary. Today, God still wants to come to us through Mary. As she receives from God’s hands graces for her children, but also crosses, Mary lends them her personal feminine touch, made out of motherly sweetness and love. As she stands near her Son and utters her Fiat, Mary fights the great fight against Satan, against evil. As a mother, she teaches her children to remain when in plight witnesses of Christ and His love for all. At the end of this Mass, united with many dioceses of France and many churches, our bells will ring to manifest our solidarity with Eastern Christians. We invite you to pray for those who have been expelled from places that their families had been inhabiting for many generations, on the sole grounds that they have refused to renounce their Christianity. Today, even though they have received humanitarian aid, and still receive it, they are more than ever conscious of the fact that they will not go back to their homes. Many of them consider fleeing, so as to provide their families and children with a better future. You may also entrust yourselves to the intercession of the twenty one Coptic martyrs, who went and met their deaths with Jesus’ name on their lips. As an answer to our prayer, Eastern Christians teach us to live as witnesses of Christ. This testimony is unpopular: love of God unto death inconveniences those who only know love of themselves. The third World War, that the Holy Father mentioned several times, has many battlefields… Those very visible in the East… those less visible in the West. Still, the reasons for the battle are everywhere the same: refusal of God our Maker, refusal of Christ and His love message. The opposing forces make up two sides: God’s side, and Satan’s side. Satan is the destroyer of creation, he is par excellence he who divides, he is the apologist of individualism, of a quest for pleasure that despises the weak and the little, he is the instigator of the most vile and barren instincts in the hearts of men and in laws. His aim is to defile creation, to incite men to squander their dignity of children and friends of God, so as to acquire another kind of “dignity”, far more elating, the dignity for mankind to define itself, to legitimate any kind of behaviour, especially if it is out of keeping with nature and its laws. Satan has been at work for a long time. The light of God and the enlightenment of freethinking have often clashed together in the hearts of men. Yet, our times witness a paradox. How can a society that commits itself to promoting an ecology of nature, deliberately ignore the fight for an ecology of man? True enough, once reason had been set free it became destructive, and its first aim was to assault nature; more recently, it has turned on man. Baby seals are protected, while human babies are jettisoned… We commit ourselves to preserving clean air, while we omit to fight images and media texts that promote violence and debase human bodies to the status of slaves. We rhapsodise about peace in the world, while we bring war into mothers’ wombs by abortion. We claim for brotherhood in various countries, while we deny children the imprescriptible right to know their biological parents and to live with them. What shall we answer when the little ones and the weak make themselves our accusers? How long shall we have to wait, how many corpses, before the world takes pains to promote a true ecology, understood as a quest for the good of all? Then, as Mary and Judith, we shall really bless God, and God Himself will bless us. At II Vespers, as every year, an address was also made before the procession of the vow to Our Lady on the Feast of her Assumption keeping the vow first made by King Louis XIII in February 1638. 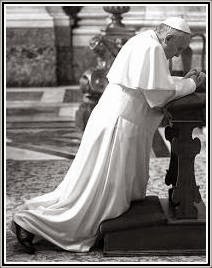 Today is the end of the great novena of prayer for France. In this hour, we are especially united to the Masses and processions that are celebrated on this occasion. At the feet of Our Lady, Mater admirabilis, we are going to say once more the prayer of Blessed Louis Cestac, as well as the prayer for the novena. During all these months, we have asked Our Lady to guide our country, to guide us towards Jesus, so as to receive from Him the graces of His mercy. We have laid down in Her Immaculate Heart our sufferings and troubles, but also our grounds for hope, so that she may obtain from Jesus that He should turn our acts towards good, and make us desire a way of truth. And now, what of it? Has France answered our question? Has France had even the slightest suspicion of it? Has France become again a land of Christendom? Whom does it behove to ask this question? Whom does it behove to answer it? The land of France will become again a land of Christendom when the land of my own heart becomes again a land of Christendom, a land of charity set ablaze by the love of Christ and His Church. On this evening of Mary’s feast day, allow me to propound a few considerations. We want our families to be united: but this union can be drawn from Jesus only. Is our home a place where we give glory to God, by morning and evening prayers, by praise and thanksgivings before and after meals? Is it a place where we willingly say: “I beg your pardon, Please, and Thank you”? We want our churches to live; but can they live without us? Do we push their doors open to visit the Blessed Sacrament? Do we gladly enter them to pray, either alone or in a group? We want the good news of the Gospel to reach all men; but do we live the radicalism of Christ’s message, so that its radiance can be seen through our works, and becomes for our neighbours a reason that prompts them to seek God? Do we read the Gospels, do we meditate them? Everyday… sometimes… rarely… never? The nine months of the novena were a time of pregnancy. Let us therefore discard the clothes of part-time Christians, so as really to put on Christ; namely, let us honour our baptism by living as witnesses. The hearts of so many men who ignore Christ are yearning for us. Let us therefore put on our sandals, and walk on the paths of our hearts, our families, our parishes, our towns, and our country, following Jesus and Mary.